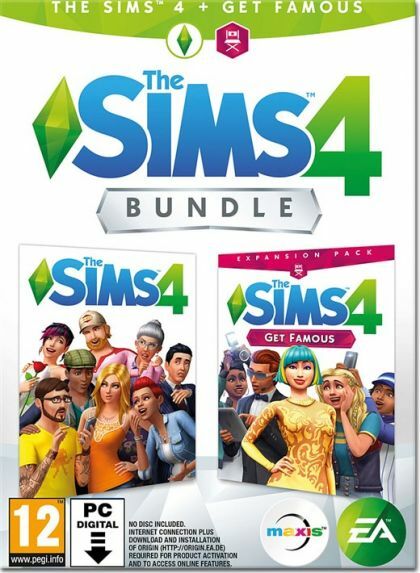 Get The Sims 4, The Sims 4 Get Famous Expansion and The Sims 4 Digital Deluxe-content in one great bundle! You're in control of creating unique Sims, effortlessly building their homes, and exploring vibrant worlds. Reach for the stars and rise to celebrity status with The Sims 4 Get Famous. The Sims 4 - Enjoy the power to create and control people in a virtual world where there are no rules. Express your creativity as you customize your Sims' appearances and personalities, and build them the perfect homes. Develop your Sims' relationships, pursue careers, and explore vibrant new worlds. The Sims 4 Get Famous Expansion - Build your stardom as you pursue an acting career, become an A-lister, and guide your Sims down the unpredictable path to fame. From the studiolot to VIP parties, you choose how your Sims can gain worldwide acclaim. Customize and show off your celebrity style, and decorate your Sims' luxury house on the hills with over-the-top accessories like a solid-gold toilet. Get ready to shine bright in the spotlight and live your best celebrity life. The Sims 4 Digital Deluxe-content - Upgrade the game med innhold som gjør simmene til festens midtpunkt! You receive Life of the Party, Up All Night and a digital soundtrack featuring music from the game.